Following ‘The Lobster’ premiere, Rachel Weisz was back on the red carpet during the BFI London Film Festival for the ‘Youth’ screening on Thursday (October 15) in London, England. The actress yet again opted for a season appropriate look, wearing a brown and gold floral-lamé custom made Lanvin gown inspired by the Fall 2015 collection, which evokes 1970s night-time glamour. Oozing effortless elegance, the look was simply styled with a black clutch and jewelled bracelet. Which look did you prefer. This or the Alexander McQueen gown for ‘The Lobster’ premiere? 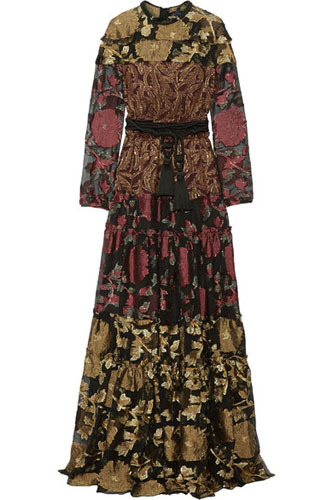 You can buy the runway version, which we’ve seen on Jenna Coleman, from Net-A-Porter.com.